NEW VARIETY. 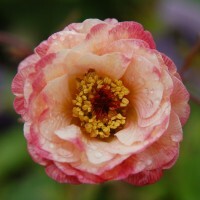 Part of the popular cocktail series of Geums, ruffled semi-double flowers that are a subtle blend of rose pink, cream and apricot. Looks great planted in the border or in large pots with the other member of the cocktail series. Full sun or partial shade. Height 60cm.